WARNING: A cyclone is very good at removing particles 5 microns and larger which are the ones you can see. Cyclones are terrible at removing particles less than 0.5 microns… and these are the ones that get deep into your lungs and cause long term heart and lung issues over time… So, never use a cyclone without a good (80% or better for 1 micron or smaller particles) filter on your vacuum or dust collector downstream. If you aren’t familiar with how cyclones work the vacuum cleaner attaches to the top center and pulls air up the center of the clear cylindrical tube. This causes a vacuum vortex to form in the clear cylinder which pulls air in from the hose attached to the side of the cylinder (you sweep up your mess with this hose). The debris enters the cylinder and spins at a high velocity and moves down to the bottom at the same time, emptying the debris into the bucket. The air in the bucket is also spinning which keeps the heavier particle trapped near the outside diameter because of centrifugal forces. The air returns up the center and to the vacuum cleaner through the center tube at the top of the cylinder. Its not exactly intuitive to understand at first but after you see some illustrations on YouTube you can get a good feel for how everything works, if you care to. The two boards are 3/4" plywood. MDF or anything will work. I just had some ply laying around so that’s what I used. The bottom board has a 7" diameter hole cut in the center and a dado cut around the bottom side that aligns it to the top of the bucket. I spread caulk in the dado and put it on the bucket to form a shape that allows it to seal from the vacuum pressure created when operating (I.E. no latches required if you aren’t going to move it around). My caulk seal was sloppy and could be done much better but it works so I didn’t redo it. The clear tube is a sheet of 0.070" thick polycarbonate. 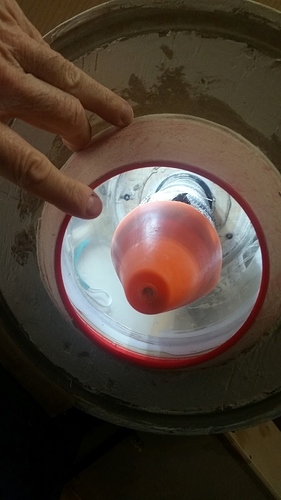 It inserts into a groove in the grey 3D printed cone shown under it. I solvent bonded them together. The gray rings help the Polycarb tube stay somewhat round but they don’t work very well. I should have used a thinner material for the cyclinder which would have made it MUCH easier to work with. The top wood plate has a 3/8" circular pocket to hold the top of the Polycarbonate round. I expected to have to make changes to this design so I just duct taped everything together. However, it works so well i’ll probably just leave it alone and focus on more important things. The red vacuum port at the center top is a 3D printed part that includes air straightening vanes inside to help reduce pressure losses. Its also a " bell" shape which may or may not make it more effective. The piece that mounts the vacuum hose to the side of the Polycarbonate cylinder is another 3D printed part but it wasn’t very strong and didn’t transition well so I ended up using a LOT of duct tape there. I think a 3D milled assembly would work much better there. Feel free to post better designs here. I encourage collaboration to make these designs better for all of us. I suggest NOT using the Inlet Port design and use 0.030" thick PETG for the vertical clear tube. The “Tube Ring” is designed so that two of them can be printed at once. I bought a Dust Deputy and mounted it to a bucket. Works great and they aren’t that expensive. Cool! Are you familiar with a related design - a Thien? Yeah, but they are less than 99+% efficient. My design is sort of a hybrid between a true cyclone and a Thien separator. The Dust Deputy cyclones work very well and are easy to implement. I’d recommend one to anyone who doesn’t want to make something themselves. When I tested my Dust Deputy it was a little less efficient than this one and this one was a little less efficient than my Dyson vacuum cleaner. Really, really nice work. The low cost, hybridization, and lack of vacuum loss is a really important development! Efficiency is kind of hard to characterize without very controlled tests so I would have to run a controlled particle through all of the cyclones to be sure of the relative effectiveness. Cyclone designs also differ in efficiency from one particle size (equivalent aerodynamic diameter) and mass so one may be more efficient for one particle size and another for another particle size. The good news is that once you get over 99% you don’t have to empty your vac for a really long time or clean the filter for quite a while. Efficiency numbers are a little non-intuitive since a 99.0% efficient system passes 10x more stuff than a 99.9% efficient system… I.E. bags fill up 10x as fast with 99.0% vs. 99.9% efficiency. The numbers past the decimal point really make a huge difference over time. My test method (posted it in the OP) for this one is somewhat crude but it gives a good ballpark #. Or, there may be a printing hub somewhere near where you live. Its a lot cheaper than going through the commercial printing services. I made this cyclone even better by putting an upside down cone on the vacuum tube (center top). I cut some holes in the cone and hot glued screen on them so the dust that comes up to the vacuum tube is deflected back out into the cyclonic air and only the air can make the turn into the tube. It increased efficiency even more. I can post a pic if anyone wants more details. I’m interested. Also, roughly what’s the cost to 3D print a unit ? I just cut off the top of a small 10" tall plastic cone and hot glued it to the bottom of a cup. The cup has cutouts around its diameter that have screen hot glued to let air flow through but not larger chips or particles. If you look at the bagless vacuum cleaners at a department store you’ll see how it all works. I’m essentially imitating the first stage of those vacuum cleaners. The debris comes in along the outside of a cylinder and spirals around keeping the heavy particles pressed against the outside. The air then moves up the center and enters the screened walls of the cup up to the vacuum port in the center top. I know its probably too complicated to understand without more pictures. If you google “cyclone vacuum” in YouTube you’ll find quite a few different designs. I’ve tried several of them and this one seems to work the best. Just using a Dust Deputy cyclone on a 5 gallon bucket is even more efficient than this design but its more top heavy and restricts airflow quite a bit more. But, you can find them for $35 on Alibaba so if you don’t want to make your own then buying one of those is a pretty easy solution. Bags fill up very quickly if you use your router much. You can pay for the cost of buying a cyclone with the money you save on bags. However, it’s best to use a bag AND a filter in the vac so your filtration is very good. I can relate to that ;-). You can mount the cyclone and bucket on the wall or from the ceiling near your router and just disconnect the shop vac from it when you use the vac somewhere else. Tony, did you ever gen up sketchup diagrams for this? For that matter, are you still using it?